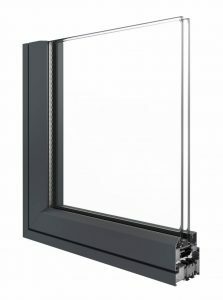 Well-respected trade and commercial fabricator Astraseal has created new, valuable opportunities for their customers nationwide with the launch of Alitherm 800, the brand-new aluminium flush casement from Smarts. Alitherm 800 is designed to provide installers with a highly-desirable and credible flush casement window that’s suited for period applications, contemporary new-build projects and everything in between. The smooth flush aesthetics and slimline transom mullion profile combine with high-security locking options and friction hinges to create a versatile yet high-performance aluminium flush casement. “We are delighted to strengthen both our extensive aluminium range and our longstanding partnership with Smarts by offering the new Alitherm 800 flush casement,” comments Colin Stanley, Operations Director at Astraseal. “Not only does Alitherm 800 present new opportunities for our customers – capitalising on the huge demand for flush casements, it’s actually far more cost-effective compared to its PVC-u counterparts. Suited to both residential and commercial applications, Alitherm 800 takes advantage of Smart’s proven thermal break technology to deliver impressive U Values and a Window Energy Rating of ‘A’. The new flush casement is available in any RAL colour and can even be finished using Smart’s Cotswold and Sensations ranges. Alitherm 800 joins Astraseal’s full range of Smarts glazing products which include windows, doors, sliding doors and even curtain walling. Most recently, the Wellingborough fabricator added the Designer Door range, Smart’s premium range of aluminium entrance doors. Alongside Smart aluminium, Astraseal also manufacture a full range of PVC-u glazing products from leading systems houses including Eurocell, REHAU and Synseal. With one of the biggest portfolios in the industry, Astraseal has built a strong reputation for high-quality aluminium and PVC-u products including windows, doors and conservatories. For over 30-years, operating from Wellingborough, Northamptonshire, Astraseal’s ethos has been to offer exceptional products with customer service that goes above and beyond.